As we were about to shut the front door of the one-bedroom condo that we'd been renting the past year & a half I said to Ken, "Take a look around. Another chapter closed & another one beginning"! This past Saturday afternoon we shut that door and dropped off the keys to our landlord. I think both of us were too tired from packing, moving, downsizing (again), and cleaning (the condo & Nirvana's cushions) to feel anything more than relief at the time. We'd already gone through selling our house 2.5 years ago, so emotionally leaving a rental wasn't so bad. The downsizing .. it was still difficult even though we'd downsized twice already in the past 2.5 years. I'll have more about what we did in another post soon. We weren't headed to our sailboat after dropping off the keys .. we were headed to a little beach town about 40 minutes away to a condo that we're now renting with family. 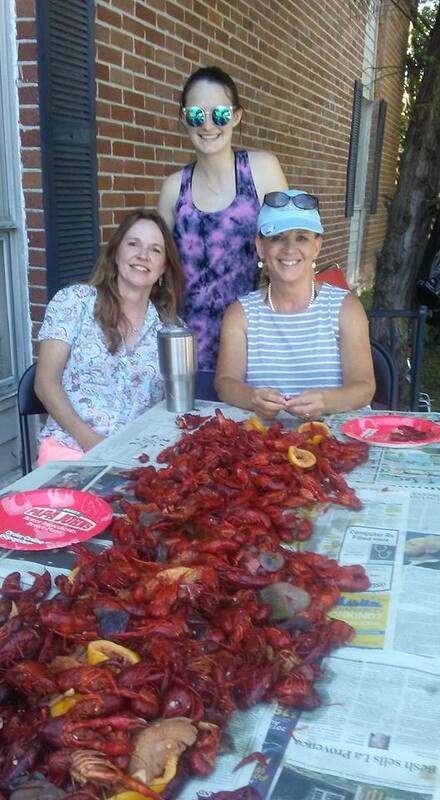 Since Mother's Day was the next day, we were planning a crawfish boil with family. This was exactly what we needed! 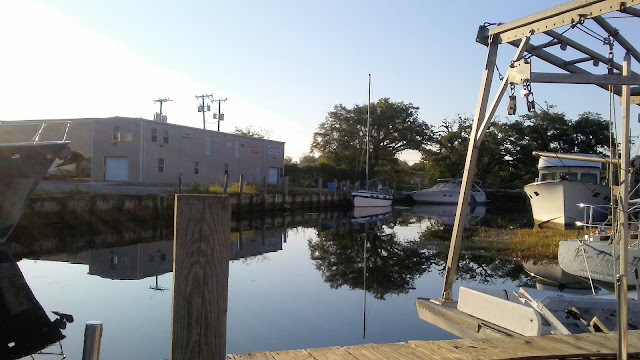 I'll have more about this condo in another post, but it's a place where Ken & I can escape every now & then ... and store a bunch of boat stuff until we're ready to bring it on Nirvana. 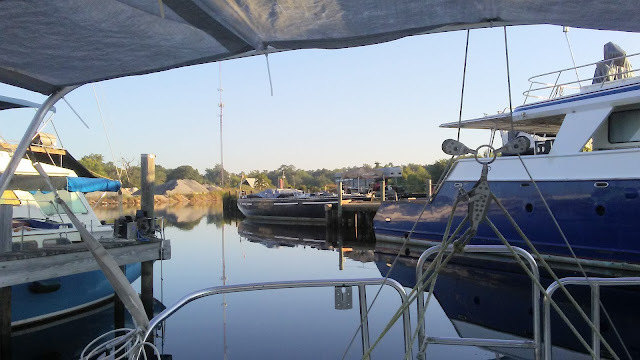 We'll spend most of our time on our sailboat ... getting her ready for cruising later this year. Below is a picture of our daughter & her mother-in-law that we're sharing the condo with. The weather was perfect, our son-in-law boiled the crawfish just right (he learned from Ken), and it was a great Mother's Day! Monday morning we woke up early & headed back to Nirvana. Ken & I still have a few loose ends with work, and we spent the first half of the day taking care of some of those. Ken spent the afternoon installing a window unit into our v-berth hatch. He had to get a little creative, but we had a/c for our first night on Nirvana! Our first night was pretty good! Our daughter & son-in-law surprised us with a visit, and they stayed for quite a while. They hadn't been on our boat in a few years because we've been in "project" mode, and they said it was bigger than they remembered. 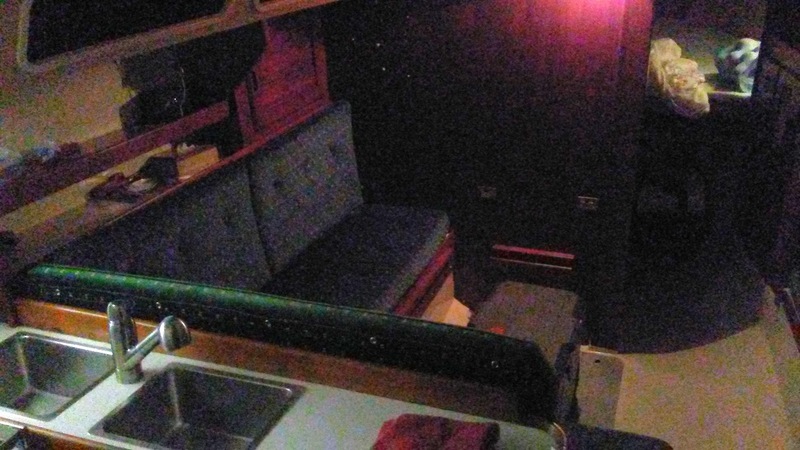 With the cleaned cushions back on & music playing in the salon & cockpit, it was quite comfortable. While they were there, we brought our new 12v Engel fridge/freezer on board & set it in the salon. It makes a great coffee table! We really enjoyed their visit & appreciate their support. They're looking forward to visiting us in the Bahamas! I took the photo below just before throwing the sheets on the v-berth mattress & crawling into bed. I love the soft glow at night! 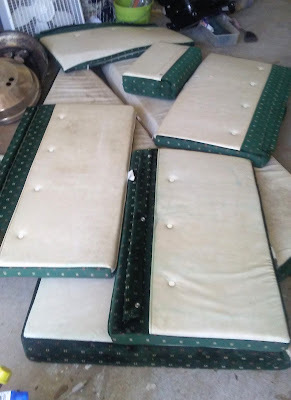 With the original v-berth cushions and two layers of foam (one layer of yellow foam & one layer of gel-infused memory foam), we slept pretty well. It doesn't hurt that the weather was perfect for our first night .. no rain, lightning (whew! ), or wind. The boat didn't move! Notice the Engel freezer in the salon? While we were excited about our first night as liveaboards, I don't think it's sunk in yet that we're living on Nirvana now. Maybe it's because we have the beach condo or maybe because we've been working on our dream for over 7 years .. it's so surreal. The next morning we enjoyed our coffee with these views. The morning was so peaceful! We've been in a boatyard/kinda marina the past year, and we hope to move to another marina within the next few weeks. Since we still have a decent amount of boat work to do, we're living on Nirvana with not much more than a coffee pot, our propane grill (gotta hook up & test our alcohol stove), some toiletries, two duffel bags for clothes (one for each of us), the Engel fridge/freezer, and a 12v television that we ordered yesterday. Don't judge .. while we think TV is mostly crap, we do enjoy having something to watch during bad weather. I'm sure we'll appreciate it even more on the boat! We also have a huge music collection with speakers in the cockpit and in the salon. I think that's all we need for now. The place we're docked has a bathroom, so we're using their shower instead of cleaning up in our cockpit or tiny head. We were going to join a gym for showers because the bathroom was so funky where we're staying. Imagine our surprise when we went to use their bathroom Monday and found that it had been repaired & painted .. talk about perfect timing! Things have really been timed just right lately with the renovated bathroom & the beach condo opportunity that fell in our laps. Ooh .. I hope I haven't jinxed us! Here's a morning view of our salon. We decided that the freshly cleaned, original cushions look pretty good and the dark color won't show dirt as easily as the lighter color I was going to recover them with. 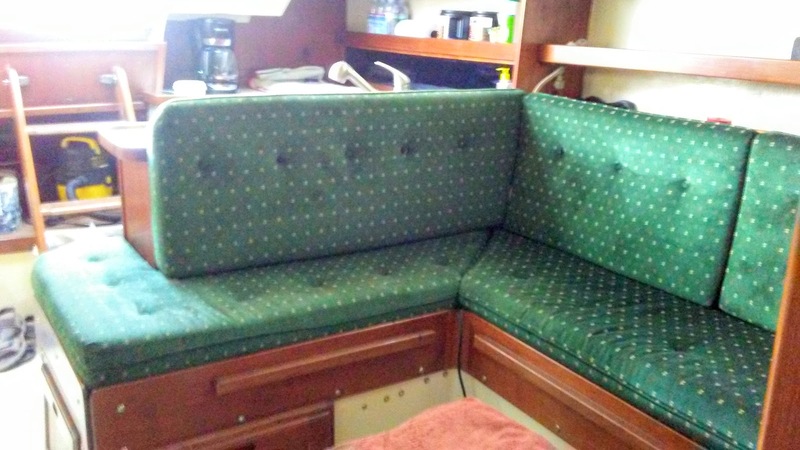 So, we scratched one project off of our list .. no recovering the cushions. Since waking up on Nirvana Tuesday morning, we've been spending our days working, running errands & doing random things to get Nirvana and our lives in order. We keep the a/c off during the day & turn it on at night. We've now spent four nights on the boat, and it's been pretty cool! The only thing that takes some getting used to is crawling in & out of the v-berth. It's pretty high up there, so Ken placed a heavy container on the floor as a step. This works well, and we'll use it until we find something a bit higher to use. We're happy we figured out a solution that doesn't require construction! We haven't cooked on the boat yet, but we've been so busy that it's been no problem to just grab something quick. 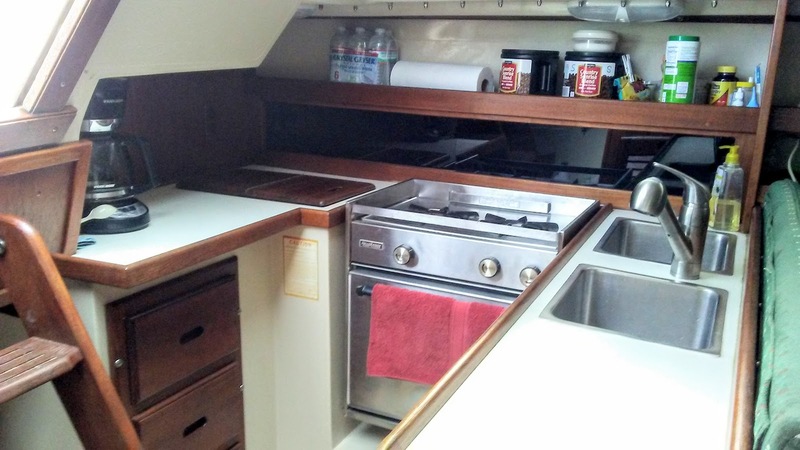 Hopefully we'll have the grill on the stern and the alcohol stove working soon. Ken's working on some electrical stuff on Nirvana (among other random things), and we're hoping to address our rigging soon. We'll then get our sails back on. In the meantime, we're trying to slow down a bit & mix boat projects with beach life .. instead of our jobs! We're also saving a good bit of money every month since moving out of the condo. Life is pretty good! Hasta luego .. until the. Mid-Life Cruising! I think you were smart to stick with the cushions as is, at least for awhile. At some point you may want to get zippered slipcovers for them that you could take off to throw in the wash. Sunscreen and just living does take a toll when you're living in hot places. So excited for your adventures! Yes, we figured the light color wouldn't last too long. I'm already using rust-colored towels to throw over the cushions. I don't sew, so towels it is for now .. LOL! If you purchase the fabric ahead of time, you can probably pay someone to sew simple slipcovers when the budget permits. We found some great deals at fabric.com -- that's what we did to get our new cushions made for Pearl. But towels certainly work in the meantime! Thanks Emily! I actually bought some cream-colored micro-fiber fabric during a Christmas sale. Might have to see if I can get some slip covers sewn in the next couple of months. Hate to have wasted the money! Huge congratulations to the two of you!! 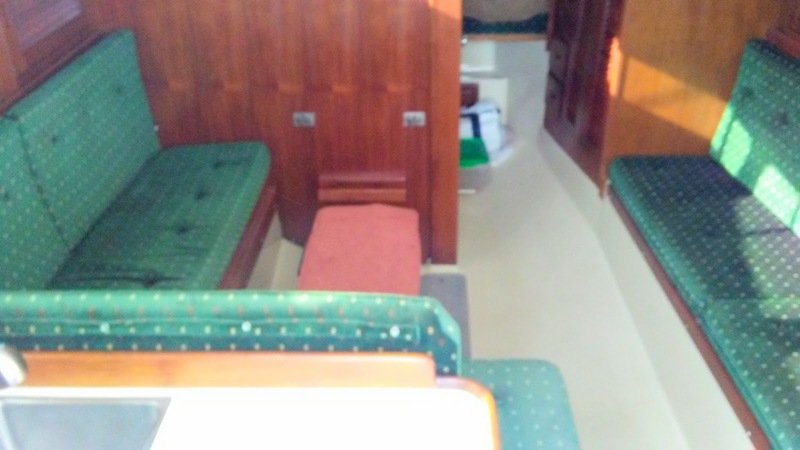 How exciting that you're now liveaboards. 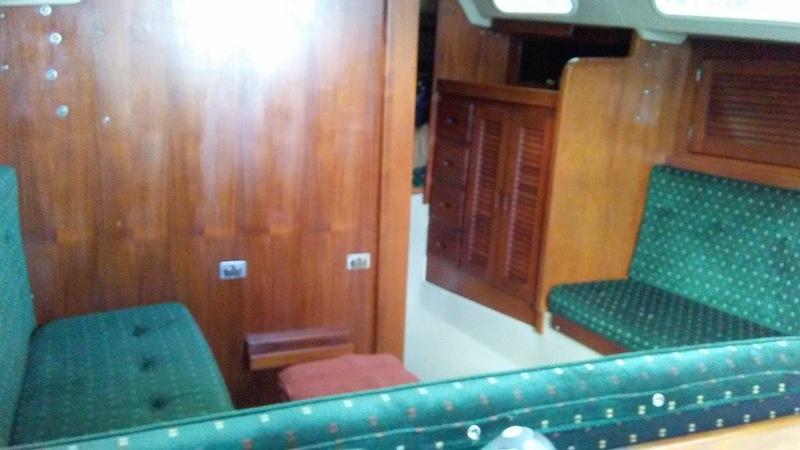 The boat looks fantastic and I'm sure you guys will be very happy living aboard. All your hard work has paid off. Congratulations! I'm looking forward to reading about your new adventure. So happy for you for the progress and excited too. So much to do and you have really paced yourself to be sure to have all ready at the right time.